S.I. Park, D.S. Brenner, G. Shin, C.D. Morgan, B.A. Copits, H.U. Chung, M.Y. Pullen, K.N. Noh, S. Davidson, S.J. Oh, J. Yoon, K.-I. Jang, V.K. Samineni, M. Norman, J.G. Grajales-Reyes, S.K. Vogt, S.S. Sundaram, K.M. Wilson, J.S. Ha, R. Xu, T. Pan, T.-I. Kim, Y. Huang, M.C. Montana, J.P. Golden, M.R. Bruchas, R.W. Gereau and J.A. Rogers, "Soft, Stretchable, Fully Implantable Miniaturized Optoelectronic Systems for Wireless Optogenetics," Nature Biotechnology 33(12), 1280-1286 (2015). M.A. Brenckle, H. Cheng, S. Hwang, H. Tao, M. Paquette, D.L. Kaplan, J.A. Rogers, Y. Huang and F.G. Omenetto, "Modulated Degradation of Transient Electronic Devices through Multilayer Silk Fibroin Pockets," ACS Applied Materials and Interfaces 7, 19870-19875 (2015). A.E. Islam, J.A. Rogers and M.A. Alam, "Recent Progress in Obtaining Semiconducting Single-Walled Carbon Nanotubes for Transistor Applications," Advanced Materials 27, 7908-7937 (2015). C. Yu, P. Yuan, E.M. Erickson, C.M. Daly, J.A. Rogers and R.G. Nuzzo, "Oxygen Reduction Reaction Induced pH-Responsive Chemo-Mechanical Hydrogel Actuators," Soft Matter 11, 7953-7959 (2015). C.H. Lee, H. Kim, D.V. Harburg, G. Park, Y. Ma, T. Pan, J.S. Kim, N.Y. Lee, B.H. Kim, K.-I. Jang, S.-K. Kang, Y. Huang, J. Kim, K.-M. Lee, C. Leal and J.A. 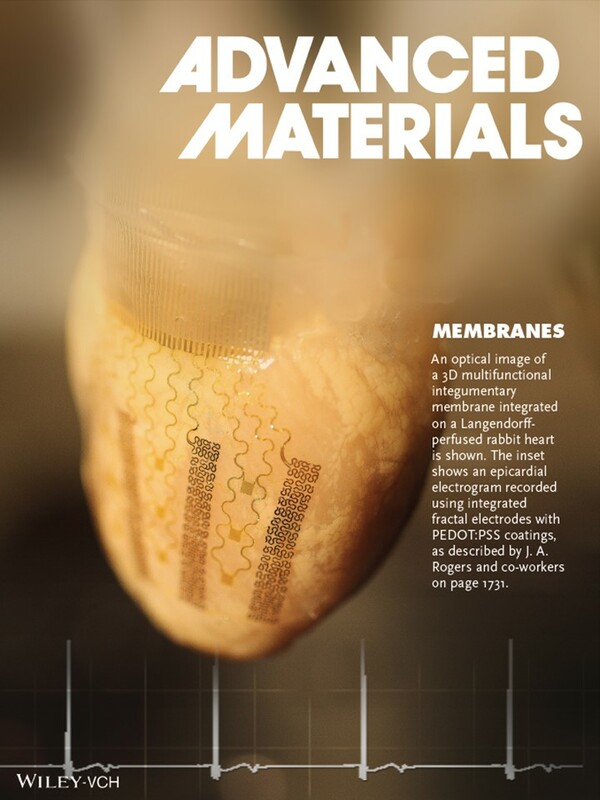 Rogers, "Biological Lipid Membranes for On-Demand, Wireless Drug Delivery from Thin, Bioresorbable Electronic Implants," NPG Asia Materials 7, e227; doi:10.1038/am.2015.114 (2015). R.C. Webb, Y. Ma, S. Krishnan, Y. Li, S. Yoon, X. Guo, X. Feng, Y. Shi, M. Seidel, N.H. Cho, J. Kurniawan, J. Ahad, N. Sheth, J. Kim, J.G. Taylor, T. Darlington, K. Chang, W. Huang, J. Ayers, A. Gruebele, R.M. Pielak, M.J. Slepian, Y. Huang, A.M. Gorbach and J.A. Rogers, "Epidermal Devices for Noninvasive, Precise, and Continuous Mapping of Macrovascular and Microvascular Blood Flow," Science Advances 1:e1500701 (2015). J. Yoon, S.-M. Lee, D. Kang, M. Meitl, C. Bower and J.A. Rogers, "Heterogeneously Integrated Optoelectronic Devices Enabled by Micro-Transfer Printing," Advanced Optical Materials 3, 1313-1335 (2015). E.R. Siuda, J.G. McCall, R. Al-Hasani, G. Shin, S.I. Park, M.J. Schmidt, S.L. Anderson, W.J. Planer, J.A. Rogers and M.R. Bruchas, "Optodynamic Simulation of b-Adrenergic Receptor Signaling," Nature Communications 6:8480 | DOI: 10.1038/ncomms9480 (2015). Y. Zhang, Z. Yan, K. Nan, D. Xiao, Y. Liu, H. Luan, H. Fue, X. Wang, Q. Yang, J. Wang, W. Ren, H. Si, F. Liu, L. Yang, H. Li, J. Wang, X. Guo, H. Luo, L. Wang, Y. Huang and J.A. Rogers, "A Mechanically Driven Form of Kirigami as a Route to 3D Mesostructures in Micro/Nanomembranes," Proceedings of the National Academy of Sciences USA 112(38), 11757-11764 (2015). J.-W. Jeong, J.G. McCall, G. Shin, Y. Zhang, R. Al-Hasani, M. Kim, S. Li, J.Y. Sim, K.-I. Jang, Y. Shi, D.Y. Hong, Y. Liu, G.P. Schmitz, L. Xia, Z. He, P. Gamble, W.Z. Ray, Y. Huang, M.R. Bruchas and J.A. Rogers, "Wireless Optofluidic Systems for Programmable In Vivo Pharmacology and Optogenetics," Cell 162, 1-13 (2015). C. Dagdeviren, Y. Shi, P. Joe, R. Ghaffari, G. Balooch, K. Usgaonkar, O. Gur, P.L. Tran, J.R. Crosby, M. Meyer, Y. Su, R. C. Webb, A.S. Tedesco, M.J. Slepian, Y. Huang and J.A. Rogers, "Conformal Piezoelectric Systems for Clinical and Experimental Characterization of Soft Tissue Biomechanics," Nature Materials 14, 728-736 (2015). R. Al-Hasani, J.G. McCall, G. Shin, A.M. Gomez, G.P. Schmitz, J.M. Bernardi, C.-O. Pyo, S.I. Park, C.M. Marcinkiewcz, N.A. Crowley, M.J. Krashes, B.B. Lowell, T.L. Kash, J.A. Rogers and M.R. Bruchas, "Distinct Subpopulations of Nucleus Accumbens Dynorphin Neurons Drive Aversion and Reward," Neuron 87, 1063-1077 (2015). M.S. Onses, E. Sutanto, P.M. Ferreira, A.G. Alleyne and J.A. Rogers, "Mechanisms, Capabilities, and Applications of High-Resolution Electrohydrodynamic Jet Printing," Small 11(34), 4237-4266 (2015). Y. Shi, H. Luo, L. Gao, C. Gao, J.A. Rogers, Y. Huang and Y. Zhang, "Analyses of Postbuckling in Stretchable Arrays of Nanostructures for Wide-Band Tunable Plasmonics," Proceedings of the Royal Society A 471: 20150632 (2015). A.M. Hussain, F.A. Ghaffar, S.I. Park, J.A. Rogers, A. Shamim and M.M. 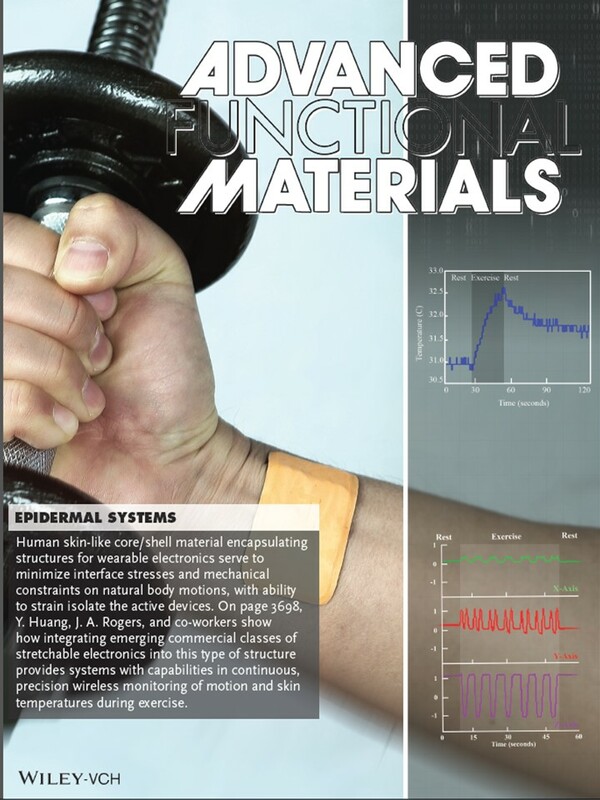 Hussain, "Metal/Polymer Based Stretchable Antenna for Constant Frequency Far-Field Communication in Wearable Electronics," Advanced Functional Materials 25, 6565-6575 (2015). H. Tao, B. Marelli, M. Yang, B. An, M.S. Onses, J.A. Rogers, D.L. Kaplan and F.G. Omenetto, "Inkjet Printing of Regenerated Silk Fibroin: From Printable Forms to Printable Functions," Advanced Materials 27, 4273-4279 (2015). C.H. Lee, S.-K. Kang, G.A. Salvatore, Y. Ma, B.H. Kim, Y. Jiang, J.S. Kim, L. Yan, D.S. Wie, A. Banks, S.J. Oh, X. Feng, Y. Huang, G. Troester and J.A. Rogers, "Wireless Microfluidic Systems for Programmed, Functional Transformation of Transient Electronic Devices," Advanced Functional Materials 25, 5100-5106 (2015). S.I. Park, G. Shin, A. Banks, J.G McCall, E.R. Siuda, M.J Schmidt, H.U. Chung, K.N. Noh, J. G.-H. Mun, J. Rhodes, M.R. Bruchas and J.A. Rogers, "Ultraminiaturized Photovoltaic and Radio Frequency Powered Optoelectronic Systems for Wireless Optogenetics," Journal of Neural Engineering 12 056002 (2015). S.-M. Hur, M.S. Onses, A. Ramirez-Hernandez, P.F. Nealey, J.A. Rogers and J.J. de Pablo, "Interplay of Surface Energy and Bulk Thermodynamic Forces in Ordered Block Copolymer Droplets," Macromolecules 48, 4717-4723 (2015). S. Wang, Y. Huang, and J.A. Rogers, "Mechanical Designs for Inorganic Stretchable Circuits in Soft Electronics," IEEE Transactions on Components, Packaging and Manufacturing Technology 5(9), 1201-1218 (2015). N. Ahmed, C. Dagdeviren, J.A. 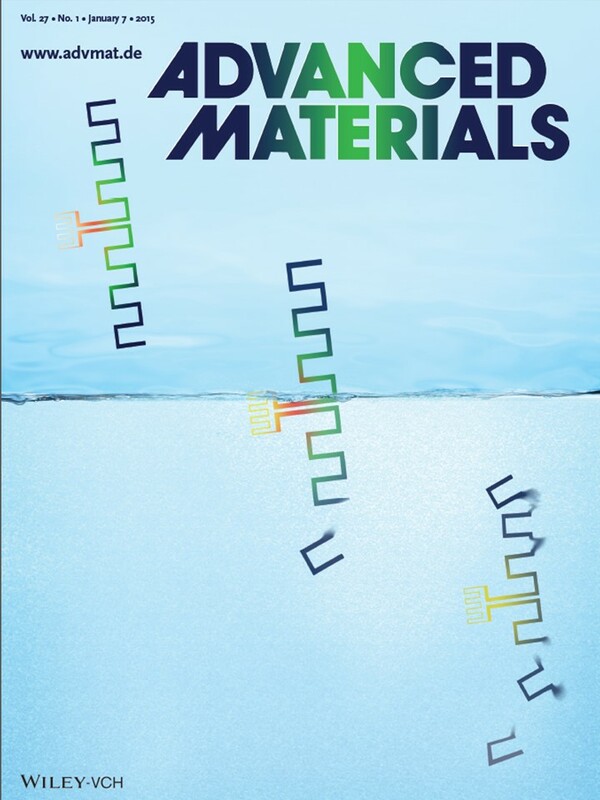 Rogers and P.M. Ferreira, "Active Polymeric Composite Membranes for Localized Actuation and Sensing in Microtransfer Printing," Journal of Microelectromechanical Devices 24(4) 1016-1028 (2015). X. Sheng, C. Robert, S. Wang, G. Pakeltis, B. Corbett and J.A. 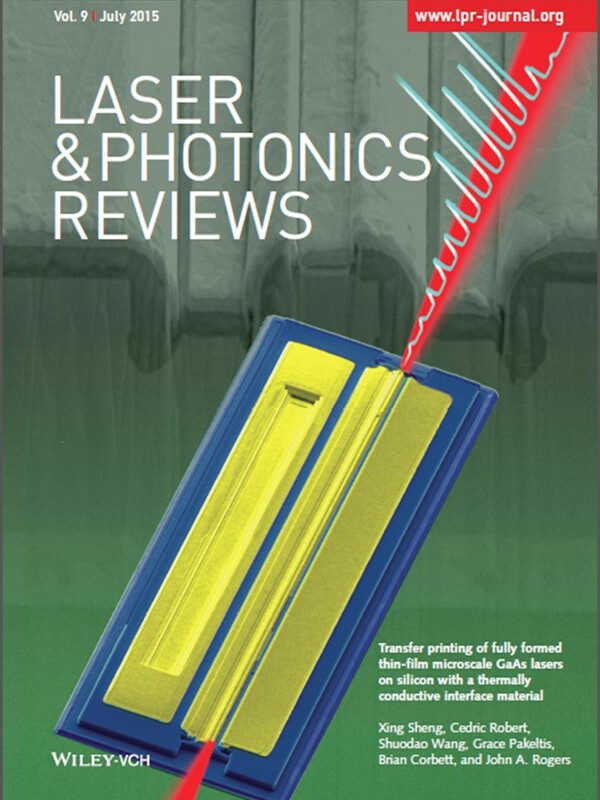 Rogers, "Transfer Printing of Fully Formed Thin-Flm Microscale GaAs Lasers on Silicon with a Thermally Conductive Interface Material," Laser and Photonics Reviews 9(4), L17-L22 (2015). Y. Shi, C. Dagdeviren, C.F. Gao, J.A. Rogers and Y. Huang, "An analytic model for skin modulus measurement via conformal piezoelectric systems," Journal of Applied Mechanics (ASME Transactions) 82, 091007 (2015). C.W. Park, S.-K. Kang, H.L. Hernandez, J.A. Kaitz, D.S. Wie, J. Shin, O.P. Lee, N.R. Sottos, J.S. Moore, J.A. Rogers and S.R. 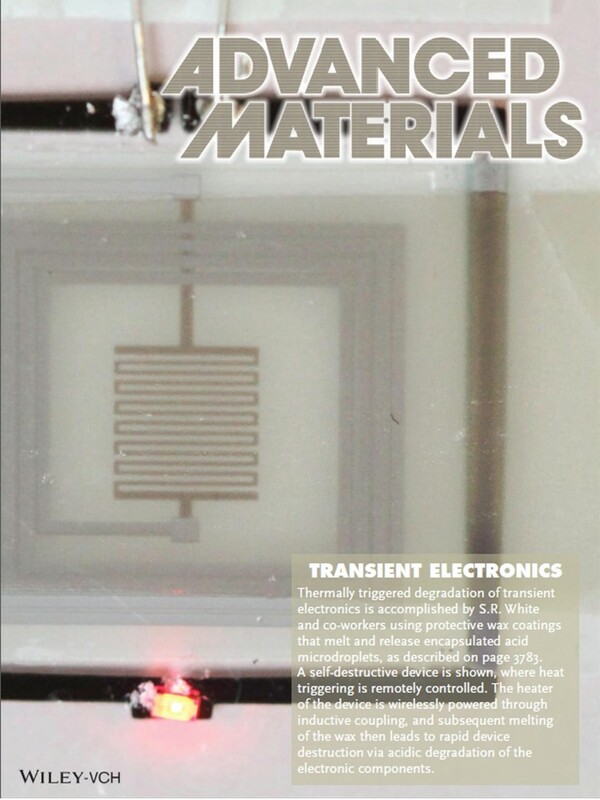 White, "Thermally Triggered Degradation of Transient Electronic Devices," Advanced Materials 27, 3783-3788 (2015). L. Gao, Y. Zhang, H. Zhang, S. Doshay, X. Xie, H. Luo, D. Shah, Y. Shi, S. Xu, H. Fang, J.A. Fan, P. Nordlander, Y. Huang and J.A. 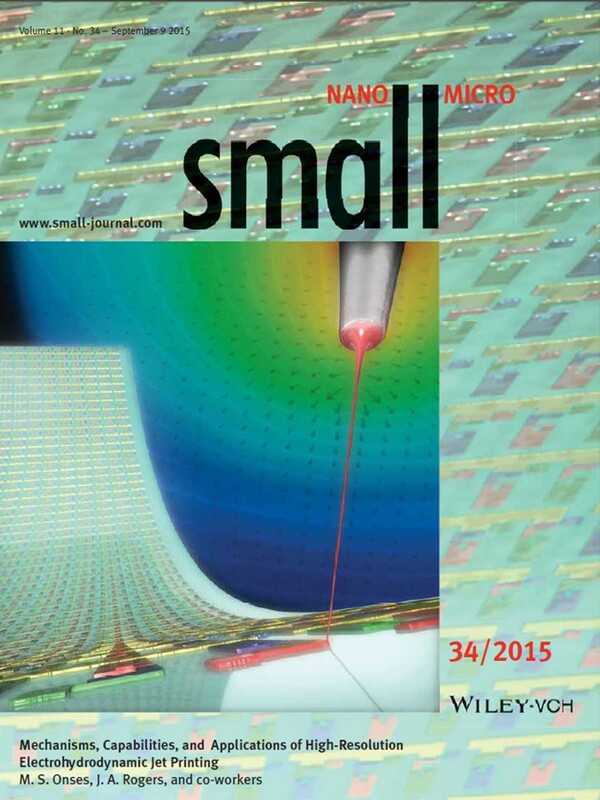 Rogers, "Optics and Nonlinear Buckling Mechanics in Large-Area, Highly Stretchable Arrays of Plasmonic Nanostructures," ACS Nano 9(6) 5968-5975, (2015). J. Kim, A. Banks, Z. Xie, S.Y. Heo, P. Gutruf, J.W. Lee, S. Xu, K.-I. Jang, F. Liu, G. Brown, J. Choi, J.H. Kim, X. Feng, Y. Huang, U. Paik and J.A. Rogers, "Miniaturized Flexible Electronic Systems with Wireless Power and Near-Field Communication Capabilities," Advanced Functional Materials 25, 4761-4767 (2015). C.H. Lee, Y. Ma, K.-I. Jang, A. Banks, T. Pan, X. Feng, J.S. Kim, D. Kang, M.S. Raj, B.L. McGrane, B. Morey, X. Wang, R. Ghaffari, Y. Huang and J.A. 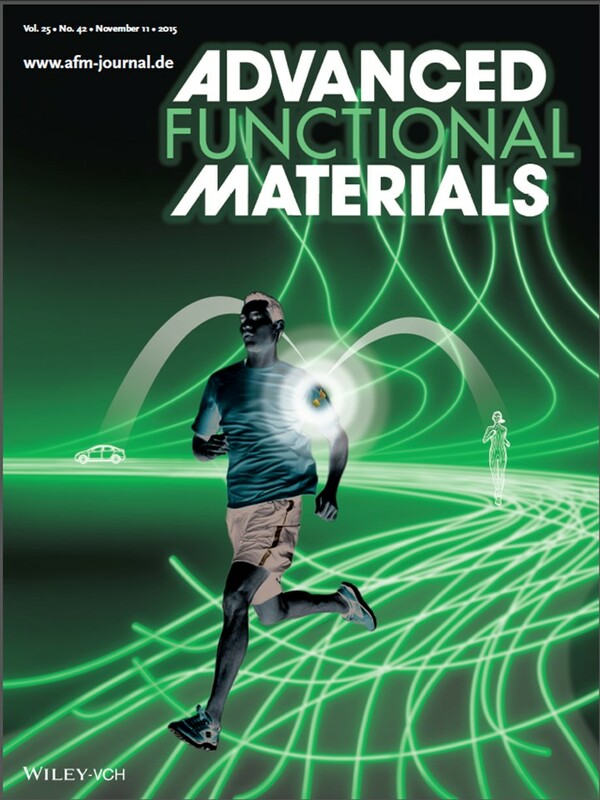 Rogers, "Soft Core/Shell Packages for Stretchable Electronics," Advanced Functional Materials 25, 3698-3704 (2015). J. Song, C. Lu, S.H. Jin, S.N. Dunham, X. Xie, J.A. Rogers, Y. Huang, "Purification of Single-Walled Carbon Nanotubes Based on Thermocapillary Flow," Journal of Applied Mechanics 82, 071010-1 (2015). H. Ning, J.H. Pikul, R. Zhang, X. Li, S. Xu, J. Wang, J.A. Rogers, W.P. King and P.V. Braun, "Holographic Patterning of High-Performance On-Chip 3D Lithium-Ion Microbatteries," Proceedings of the National Academy of Sciences USA 112(21), 6573-6578 (2015). S.-W. Hwang, C.H. Lee, H. Cheng, J.-W. Jeong, S.-K. Kang, J.-H. Kim, J. Shin, J. Yang, Z. Liu, G.A. Ameer, Y. Huang and J.A. 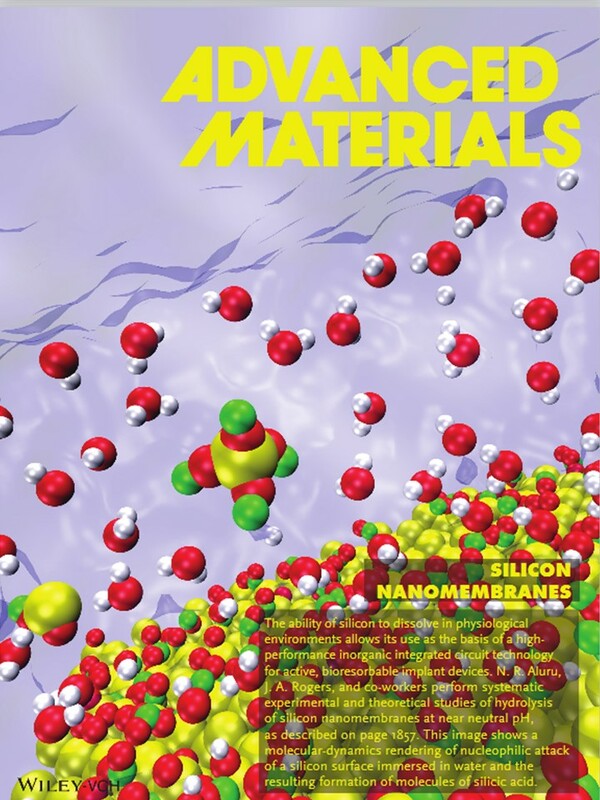 Rogers, "Biodegradable Elastomers and Silicon Nanomembranes/Nanoribbons for Stretchable, Transient Electronics, and Biosensors," Nano Letters 15, 2801-2808 (2015). S.-K. Kang, G. Park, K. Kim, S.-W. Hwang, H. Cheng, J. Shin, S. Chung, M. Kim, L. Yin, J. Chul Lee, K.-M. Lee and J.A. Rogers, "Dissolution Chemistry and Biocompatibility of Silicon- and Germanium-Based Semiconductors for Transient Electronics," ACS Applied Materials and Interfaces 7, 9297-9305 (2015). S.P. Lee, L.E. Klinker, L. Ptaszek, J. Work, C. Liu, F. Quivara, C. Webb, C. Dagdeviren, J.A. Wright, J.N. Ruskin, M. Slepian, Y. Huang, M. Mansour, J.A. Rogers and R. Ghaffari, "Catheter-Based Systems With Integrated Stretchable Sensors and Conductors in Cardiac Electrophysiology," Proceedings of the IEEE 103(4), 682-689 (2015). J. He, R.G. Nuzzo and J.A. 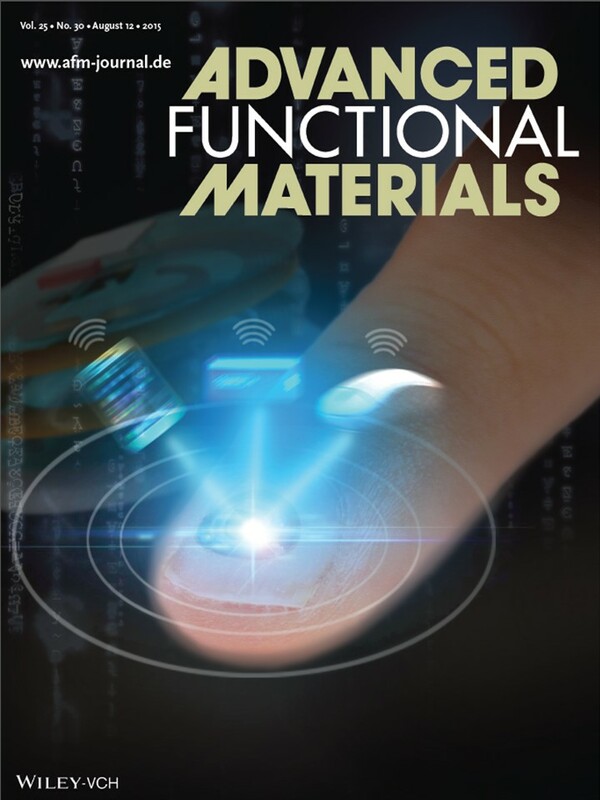 Rogers, "Inorganic Materials and Assembly Techniques for Flexible and Stretchable Electronics," Proceedings of the IEEE 103(4), 619-632 (2015). S.H. Jin, S.-K. Kang, I.-T. Cho, S.Y. Han, H.U. Chung, D.J. Lee, J. Shin, G.W. Baek, T.-I. Kim, J.-H. Lee and J.A. Rogers, "Water-Soluble Thin Film Transistors and Circuits Based on Amorphous Indium-Gallium-Zinc Oxide," ACS Appl. Mater. Interfaces 7, 8268-8274 (2015). L. Klinker, S. Lee, J. Work, J. Wright, Y. Ma, L. Ptaszek, R.C. Webb, C. Liu, N. Sheth, M. Mansour, J.A. Rogers, Y. Huang, H. Chen, R. Ghaffari, "Balloon Catheters with Integrated Stretchable Electronics for Electrical Stimulation, Ablation and Blood Flow Monitoring," Extreme Mechanics Letters 3, 45-54 (2015). Y. Zhang, Y. Huang and J.A. Rogers, "Mechanics of Stretchable Batteries and Supercapacitors," Current Opinion in Solid State and Materials Science 19, 190-199 (2015). J. Song, Y. Li, F. Du, X. Xie, Y. Huang and J.A. Rogers, "Thermal Analysis for Laser Selective Removal of Metallic Single-Walled Carbon Nanotubes," Journal of Applied Physics 117, 165102 (2015). J.-W. Jeong, G. Shin, S.I. Park, K.J. Yu, L. Xu and J.A. Rogers, "Soft Materials in Neuroengineering for Hard Problems in Neuroscience," Neuron 86(1), 175-186 (2015). X. Xie, M.A. Wahab, Y. Li, A.E. Islam, B. Tomic, J. Huang, B. Burns, E. Seabron, S.N. Dunham, F. Du, J. Lin, W.L. Wilson, J. Song, Y. Huang, M.A. Alam and J.A. Rogers, "Direct Current Injection and Thermocapillary Flow for Purification of Aligned Arrays of Single-Walled Carbon Nanotubes," Journal of Applied Physics 117, 134303 (2015). J.S. Norton, D.S. Leeb, J.W. Lee, W. Lee, O. Kwon, P. Won, S.-Y. Jung, H. Cheng, J.-W. Jeong, A. Akce, S. Umunna, I. Nad, Y.H. Kwon, X.-Q. Wang, Z.J. Liu, U. Paik, Y. Huang, T. Bretl, W.-H. Yeo and J.A. Rogers, "Soft, Curved Electrode Systems Capable of Integration on the Auricle as a Persistent Brain-Computer Interface," Proceedings of the National Academy of Sciences USA 112(13), 3920-3925 (2015). H. Fu, S. Xu, R. Xu, J. Jiang, Y. Zhang, J.A. 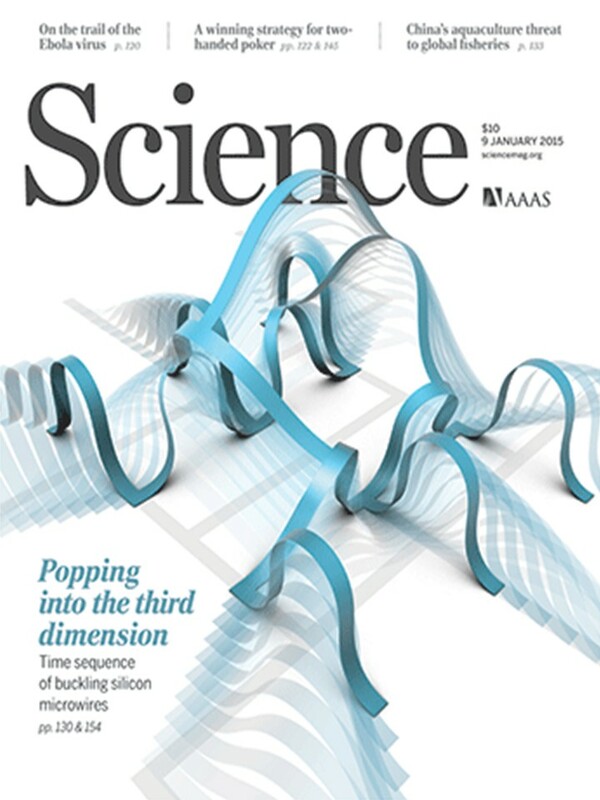 Rogers and Y. Huang, "Lateral Buckling and Mechanical Stretchability of Fractal Interconnects Partially Bonded Onto an Elastomeric Substrate," Applied Physics Letters 106, 091902 (2015). S.-K. Kang, S.-W. Hwang, S. Yu, J.-H. Seo, E.A. Corbin, J. Shin, D.S. Wie, R. Bashir, Z. Ma and J.A. 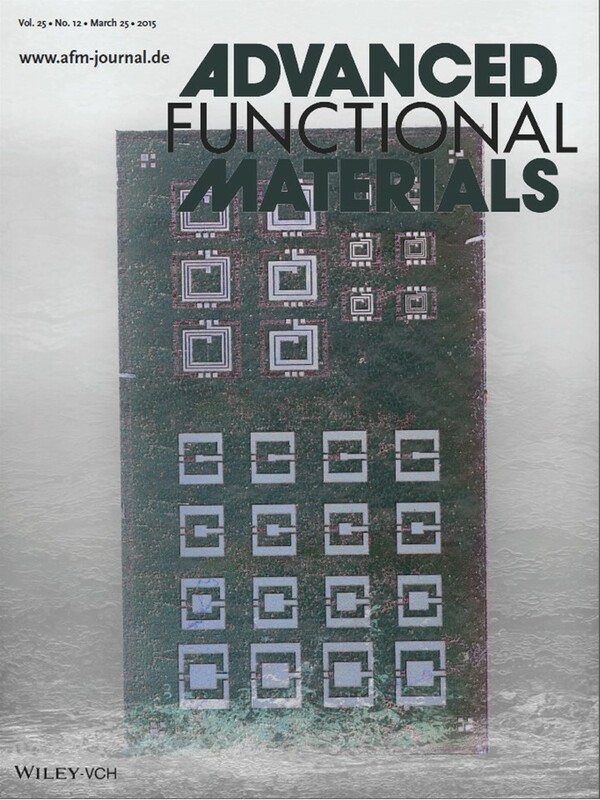 Rogers, "Biodegradable Thin Metal Foils and Spin-On Glass Materials for Transient Electronics," Advanced Functional Materials 25, 1789-1797 (2015). K.-I. Jang, H.U. Chung, S. Xu, C.H. Lee, H. Luan, J. Jeong, H. Cheng, G.-T. Kim, S.Y. Han, J.W. Lee, J. Kim, M. Cho, F. Miao, Y. Yang, H.N. Jung, M. Flavin, H. Liu, G.W. Kong, K.J. Yu, S.I. Rhee, J. Chung, B. Kim, J.W. Kwak, M.H. Yun, J.Y. Kim, Y.M. Song, U. Paik, Y. Zhang, Y. Huang and J.A. Rogers, "Soft Network Composite Materials With Deterministic and Bio-inspired Designs," Nature Communications 6:6566, DOI: 10.1038/ncomms7566 (2015). L. Yin, A.B. Farimani, K. Min, N. Vishal, J. Lam, Y.K. Lee, N.R. Aluru and J.A. Rogers, "Mechanisms for Hydrolysis of Silicon Nanomembranes as Used in Bioresorbable Electronics," Advanced Materials 27, 1857-1864 (2015). C.H. Lee, J.-W. Jeong, Y. Liu, Y. Zhang, Y. Shi, S.-K. Kang, J. Kim, J.S. Kim, N.Y. Lee, B.H. Kim, K.-I. Jang, L. Yin, M.K. Kim, A. Banks, U. Paik, Y. Huang and J.A. 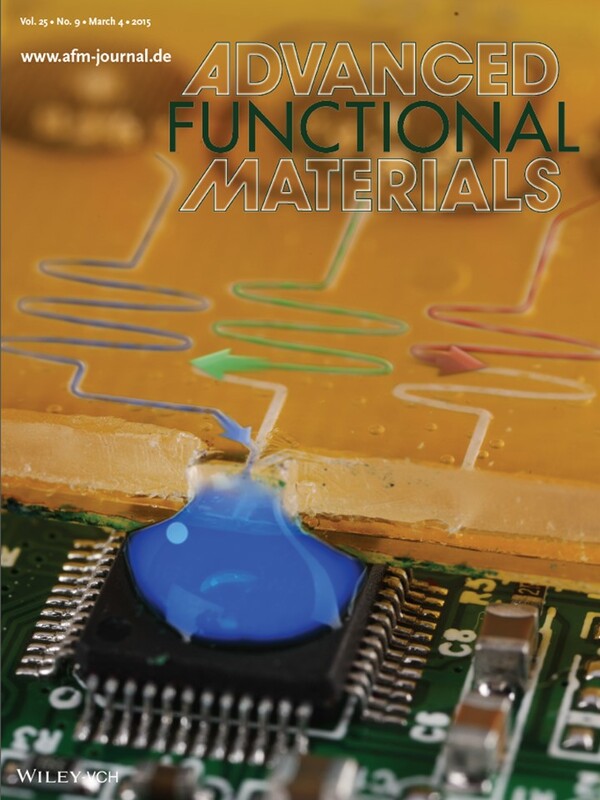 Rogers, "Materials and Wireless Microfluidic Systems for Electronics Capable of Chemical Dissolution on Demand," Advanced Functional Materials 25, 1338-1343 (2015). L. Xu, S.R. Gutbrod, Y. Ma, A. Petrossians, Y. Liu, R.C. Webb, J.A. Fan, Z. Yang, R. Xu, J.J. Whalen, J.D. Weiland, Y. Huang, I.R. Efimov and J.A. 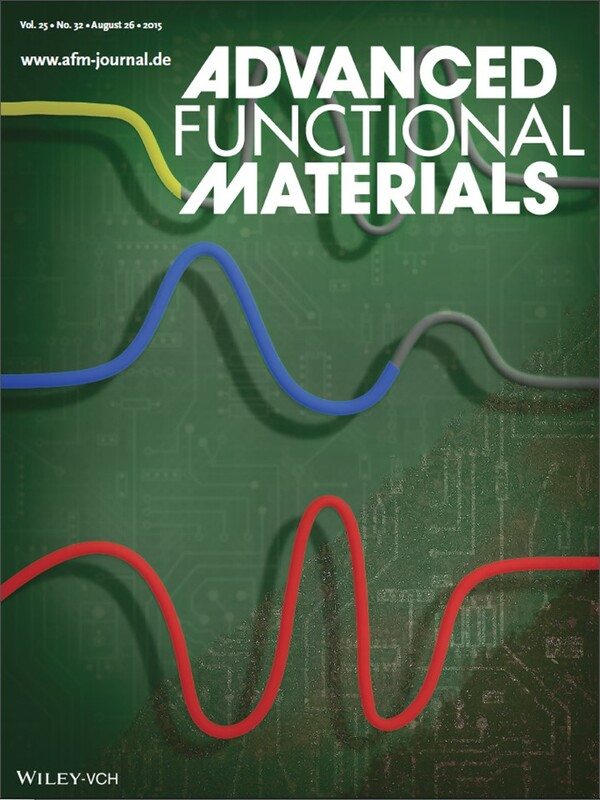 Rogers, "Materials and Fractal Designs for 3D Multifunctional Integumentary Membranes with Capabilities in Cardiac Electrotherapy," Advanced Materials 27, 1731-1737 (2015). J.A. Rogers, "Electronics for the Human Body," JAMA, The Journal of the American Medical Association 313(6), 561-562 (2015). R. Xua, K.-I. Jang, Y. Ma, H.N. Jung, Y. Yang, M. Cho, Y. Zhang, Y. Huang and J.A. Rogers, "Fabric-based Stretchable Electronics with Mechanically Optimized Designs and Prestrained Composite Substrates," Extreme Mechanics Letters 1, 120-126 (2014). J. Kim, A. Banks, H. Cheng, Z. Xie, S. Xu, K.-I. Jang, J.W. Lee, Z. Liu, P. Gutruf, X. Huang, P. Wei, F. Liu, K. Li, M. Dalal, R. Ghaffari, X. Feng, Y. Huang, S. Gupta, U. Paik and J.A. 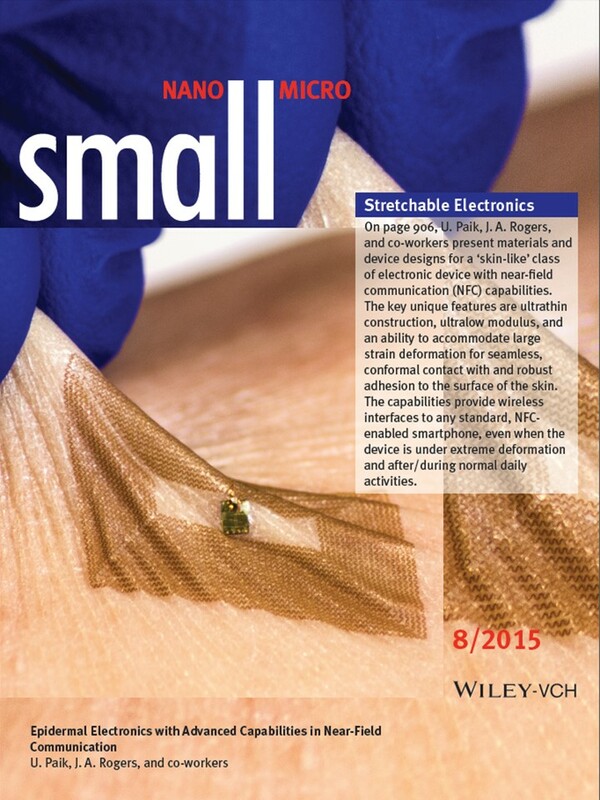 Rogers, "Epidermal Electronics with Advanced Capabilities in Near-Field Communication," Small 11(8), 906-912 (2015). R.C. Webb, R.M. Pielak, P. Bastien, J. Ayers, J. Niittynen, J. Kurniawan, M. Manco, A. Lin, N.H. Cho, V. Malyrchuk, G. Balooch and J.A. Rogers, "Thermal Transport Characteristics of Human Skin Measured In Vivo Using Ultrathin Conformal Arrays of Thermal Sensors and Actuators," PLOS ONE, DOI:10.1371/journal.pone.0118131 (2015). B.H. Kim, M.S. Onses, J.B. Lim, S. Nam, N. Oh, H. Kim, K.J. Yu, J.W. Lee, J.-H. Kim, S.-K. Kang, C.H. Lee, J. Lee, J.H. Shin, N.H. Kim, C. Leal, M. Shim and J.A. Rogers, "High-Resolution Patterns of Quantum Dots Formed by Electrohydrodynamic Jet Printing for Light-Emitting Diodes," Nano Letters 15, 969-973 (2015). C. Song, J.A. Rogers, J.-M. Kim and H. Ahn, "Patterned Polydiacetylene-Embedded Polystyrene Nanofibers Based on Electrohydrodynamic Jet Printing," Macromolecular Research 23(1), 118-123 (2015). Y. Xue, Y. Zhang, X. Feng, S. Kim, J.A. Rogers and Yonggang Huang, "A Theoretical Model of Reversible Adhesion in Shape Memory Surface Relief Structures and its Application in Transfer Printing," Journal of the Mechanics and Physics of Solids 77, 27-42 (2015). J.S. Price, X. Sheng, B.M. Meulblok, J.A. Rogers and N.C. Giebink, "Wide-Angle Planar Microtracking for Quasi-static Microcell Concentrating Photovoltaics," Nature Communications 6:6223, DOI: 10.1038/ncomms7223 (2015). Y. Su, S. Wang, Y. Huang, H. Luan, W. Dong, J.A. Fan, Q. Yang, J.A. Rogers and Y. Huang, "Elasticity of Fractal Inspired Interconnects," Small 11(3), 367-373 (2015). X. Sheng, M.H. Yun, C. Zhang, A.M. Al-Okaily, M. Masouraki, L. Shen, S. Wang, W.L. Wilson, J.Y. Kim, P. Ferreira, X. Li, E. Yablonovitch and J.A. 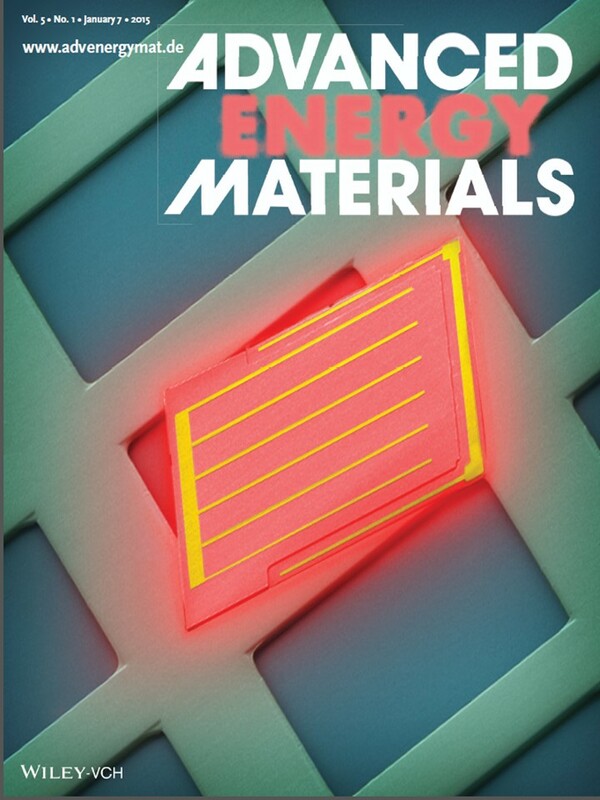 Rogers, "Device Architectures for Enhanced Photon Recycling in Thin-Film Multijunction Solar Cells," Advanced Energy Materials 5, 1400919 (2015). S. Xu, Z. Yan, K.-I. Jang, W. Huang, H. Fu, J. Kim, Z. Wei, M. Flavin, J. McCracken, R. Wang, A. Badea, Y. Liu, D. Xiao, G. Zhou, J. Lee, H.U. Chung, H. Cheng, W. Ren, A. Banks, X. Li, U. Paik, R.G. Nuzzo, Y. Huang, Y. Zhang and J.A. Rogers, "Assembly of Micro/nanomaterials into Complex, Three-Dimensional Architectures by Compressive Buckling," Science 347(6218), 154-159 (2015). S.-W. Hwang, S.-K. Kang, X. Huang, M.A. Brenckle, F.G. Omenetto and J.A. Rogers, "Materials for Programmed, Functional Transformation in Transient Electronic Systems," Advanced Materials 27, 47-52 (2015). L. Yin, C. Bozler, D.V. Harburg, F. Omenetto and J.A. Rogers, "Materials and Fabrication Sequences for Water Soluble Silicon Integrated Circuits at the 90 nm Node," Applied Physics Letters 106, 014105 (2015). doi: 10.1063/1.4905321.